Matamata /ˈmætəˌmætə/ is a town in the Waikato Region of New Zealand's North Island. It is located near the base of the Kaimai Ranges, and is a thriving farming area known for Thoroughbred horse breeding and training pursuits. 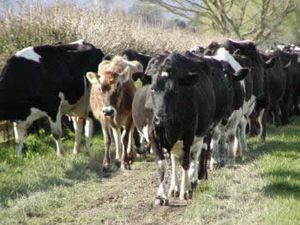 It is part of the Matamata-Piako District, which takes in the surrounding rural areas as well as Morrinsville and Te Aroha. State Highway 27 and the Kinleith Branch railway run through the town. The town has a population of 7,730 as of June 2016. A nearby farm was the location for the Hobbiton Movie Set in Peter Jackson's The Lord of the Rings. The New Zealand government decided to leave the Hobbit holes built on location as tourist attractions, since they were designed to blend seamlessly into the environment. During the interim period filming The Return of the King and The Hobbit: An Unexpected Journey they had no furniture or props, but could be entered with vistas of the farm viewed from inside them. 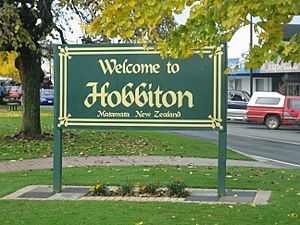 A "Welcome to Hobbiton" sign has been placed on the main road. In 2011 parts of Hobbiton began to close in preparation for the three new movies based on the first Tolkien novel, The Hobbit. In the early nineteenth century, the area including and surrounding the present-day Matamata township was part of the territory of the Ngāti Hauā. The Matamata pā itself was actually located near the present-day settlement of Waharoa, approximately 6 kilometres (4 miles) to the north. The first European thought to have visited the Matamata area was the trader Phillip Tapsell in about 1830. In 1833 the Reverend Alfred Nesbit Brown visited the area and in 1835 opened a mission near Matamata Pa, but this closed the following year when intertribal warfare broke out. In 1865 Josiah Firth negotiated with Ngāti Hauā leader Wiremu Tamihana and leased a large area of land, including the future site of the town which he named after the pā. Firth constructed a dray road to Cambridge and cleared the Waihou River so that it was navigable by his (small) boats. Firth's estate later failed and by 1904 had been wholly obtained by the Crown and was subdivided into dairy farm units to take advantage of the new technology of refrigeration. It became a dependent Town District in 1917, an independent Town District in 1919 and was constituted a borough in 1935. With the re-organisation of territorial authorities in New Zealand in 1989, Matamata became part of the Matamata-Piako District. Matamata Public School from around 1909. Matamata Public School around 1919. Matamata Facts for Kids. Kiddle Encyclopedia.